In brief: A little bland this time around, but the kara age is a great lunch at Ennju to add to our usual order of salmon skin don. A long time ago someone ordered the kara age and it was really good, but we had kind of forgotten about it until yesterday's cold wet weather had us wishing for something a little more warming than the usual salmon skin don. 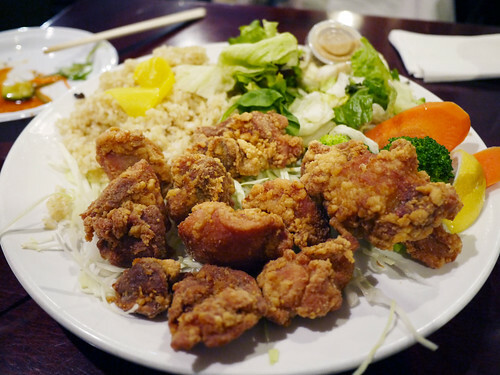 We split a small plate of cucumber salads and a huge plate of the kara age (fried chicken) and even though it was on the bland side, we walked out feeling pretty satisfied with ourselves.